Spotlight on Young Filmmakers | Kid Reporters' Notebook | Scholastic Inc.
It’s not easy to succeed in the movie business. But some lucky teens are getting a rare opportunity. 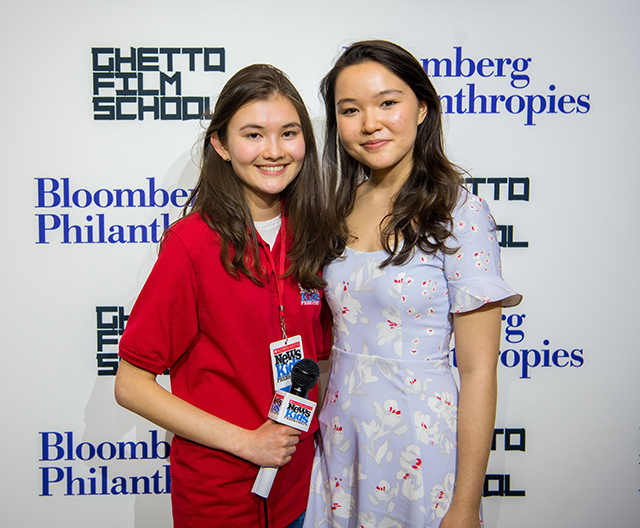 The Ghetto Film School (GFS), a nonprofit organization based in New York City and Los Angeles, gives talented high school students invaluable experience behind the camera. The GFS Fellows Program, an intense 30-week course, allows students to learn every facet of filmmaking—from writing and directing to sound editing and mixing. The teens even get expert advice from movie stars, screenwriters, and directors. Screenwriters, directors, and actors, including Ansel Elgort (in red cap), critique the work of Ghetto Film School students. Ansel Elgort, Sakina Jaffrey, Sebastian Stan, and other stars recently sat down with GFS students at Bloomberg Philanthropies in New York City. The actors read aloud the scripts of two students and then, with help from professional screenwriters and directors, offered their critiques. After wowing the actors, directors, and audience with her screenplay, Elsa explained the inspiration behind it: She wanted to explore the effects of violence and assault on women. This summer, Elsa’s script will be made into a film. GFS student Nia Stanford, a 16-year-old from New Jersey, will direct the production. Elsa, Nia, and the other students are grateful for GFS, which helps aspiring filmmakers learn their craft free of charge. Founded in 2000, GFS hopes to continue to give young people the chance to express themselves behind the camera, especially those whose voices might otherwise not be heard. Nia is ready for the opportunity. “We are the future,” she said.